Earlier this week, I revealed our rental house's master bathroom. Ugly is as ugly does, right? I think Forrest Gump said that. Or maybe I made it up. 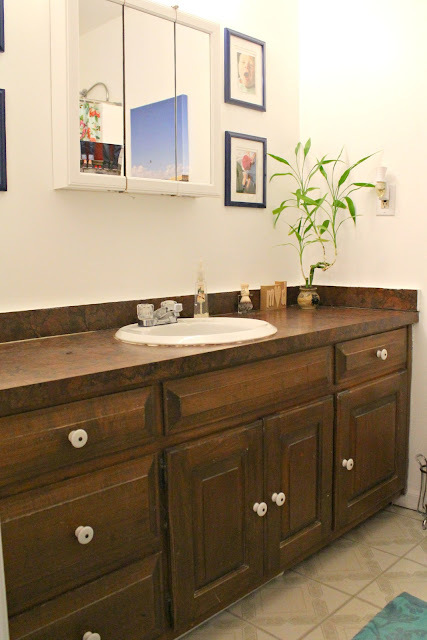 Either way, our master bathroom space is not the prettiest! But I promised you that you wouldn't have to live with the ugly master bathroom for too long. Ta da! A few updates and my previously neutral on neutral box is now lively with color. Because there were sooo many shades of neutral going on in this room (bright white, ivory, tan, gray, dark brown, light brown... I could go on), I knew that all it needed was a major dose of color. So color, it got. As renters, David and I decided not to paint the space, although we are allowed. I'm just not sure it's worth my time and energy to paint a space like this only to have to repaint in a year. So all of the small changes I've decided to make to the room are temporary and will be easy to undo. Just a reminder, here's the before. 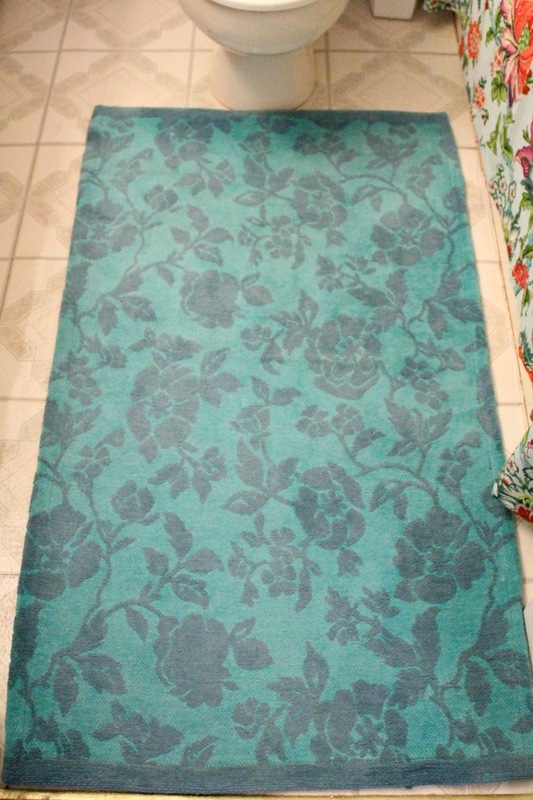 My first focus was to find a rug to cover up the ugly linoleum floor. I searched the bathroom departments of a few of my favorite decor stores without any luck. But then, as I was making my weekly stroll down the aisles of Tar-jay, I saw this rug. In. Love. It's not a bath mat, but it's a thick rug that absorbs water but dries out very quickly. 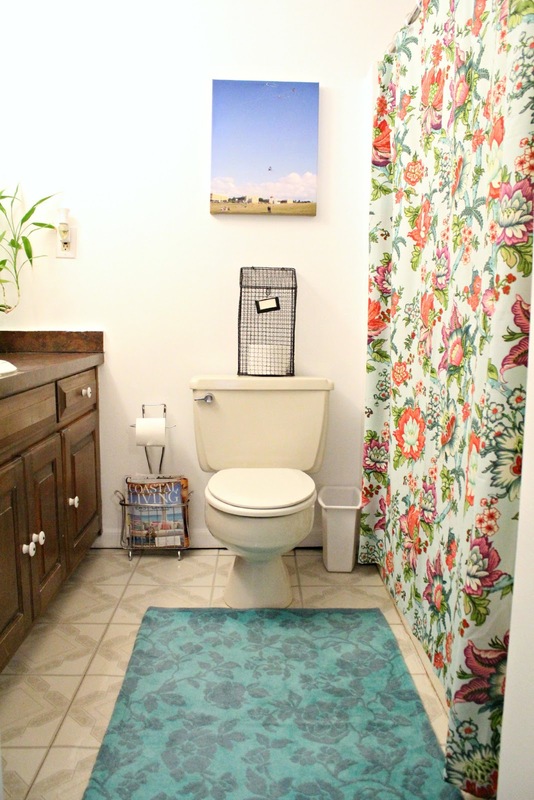 And it's much longer/wider than most bath mats, so it's perfect for this space. The more ugly linoleum coverage, the better. Boo-yah. Next up, I was on a shower curtain mission. Check out a few of my options (along with another rug option that I passed on- the green rug brought out green undertones in the neutral colors, no bueno). I couldn't say no to the colorful floral curtain I ended up with, which is from World Market. It kind of pulled at my heart strings. In fact, I saw it online and knew it was the one for me. Yes, I call my shower curtain the one. We have a deep relationship like that. 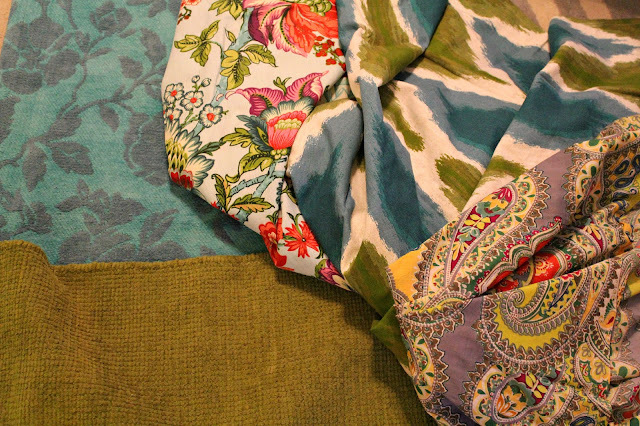 FYI, the second runner-up ikat curtain is from Target and the third runner-up paisley curtain is from World Market. 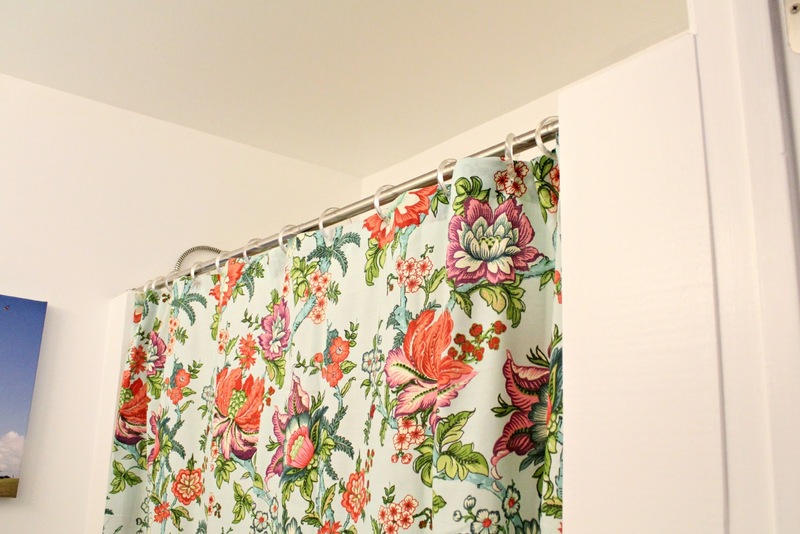 We've all heard to hang curtains "high and wide" and shower curtains are no exception. I purchased a longer shower curtain rod so I could move the curtain higher and cover up some of the awkward white trim work that runs along the side of the shower. It makes such a difference! I also added a canvas print of a photo David and I took when we visited Puerto Rico a couple of years ago. I think the pretty blue sky brings a great pop of color to the space. 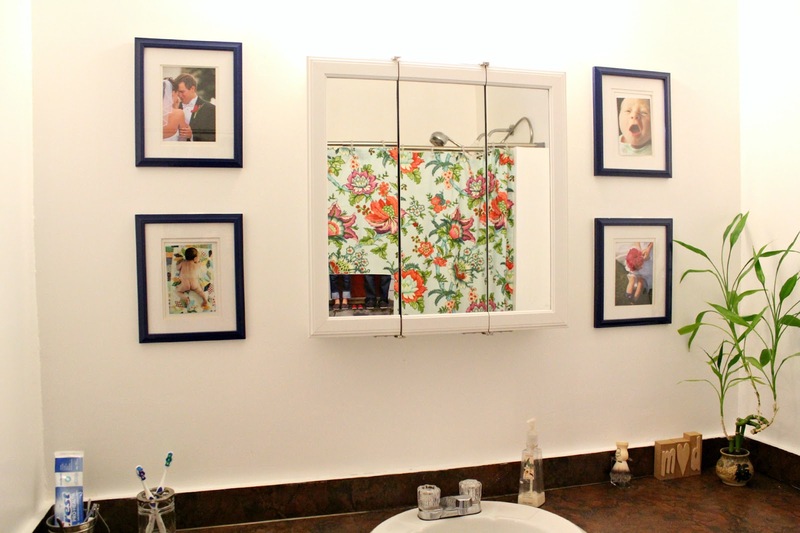 I love that you can see the colorful new shower curtain in the mirror. Beautimous. I haven't done anything yet with the vanity (besides adding the bamboo plant- who puts live plants in the bathroom?! I was desperate for color! ), but I've definitely got a few ideas. Wouldn't it be nice to take a paintbrush to it all?! Trust me, I've thought about it. If only we weren't renters! Some temporary fixes will just have to do... do I smell new knobs in my future? Mhhhm. All in all, I think these minor changes make a big difference in the space. We've still got a long way to go before we're talking beautiful, but it's definitely a start! Love the rug! And I agree with you on the canvas print--Love the pop of color that the blue sky gives. Looks great, and so funny your post and 6th Street Design School were next to each other in my BL feed, and she has the same curtain picked out in her World Market must haves... Ladies have good taste! Love the curtain! It definitely makes a world of difference in there! I think it looks so much bigger with the added color! BIG difference, Michelle! Love the shower curtain! 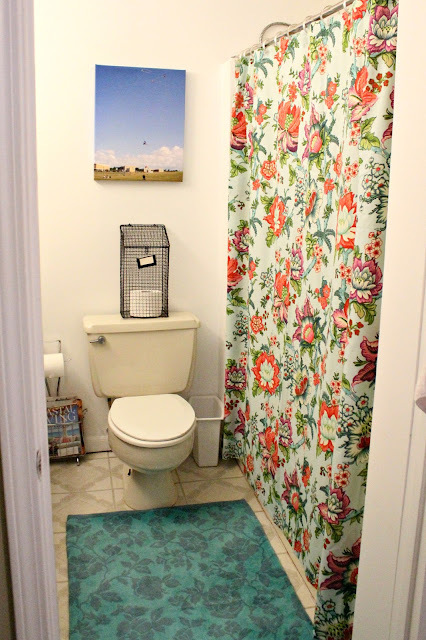 What a fun and colorful shower curtain! Love the update! Love the shower curtain! And your mixing patterns post was great! Love that curtain/rug combo!! Really brightens up the space. 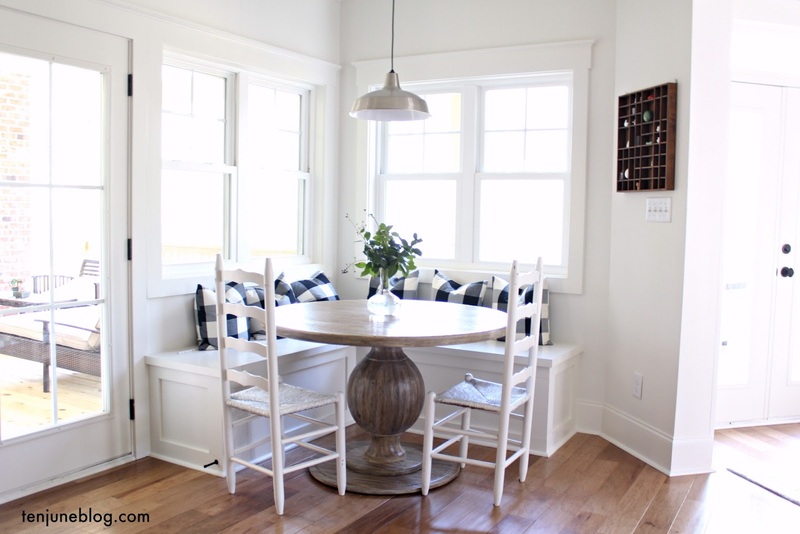 And Loved your article over at Kates!